pours very with a minimal light brown head. It has a great aroma: very chocolatey and roasty. Taste is also of roasted malt and coffee notes. You can definitely tell this is a porter by its body. It has a lot of complexity but doesn't have a very full body. Feels very silky in the mouth and goes down great. Very drinkable beer. Appearance: pours a deep dark blackish brown color with a decent two finger tan head. Some spotty lacing develops through the sesssion. Smell: mostly roasted malts and licorice. Very pleasant. Taste: what a great flavorful baltic porter. Roasted malts, bitter chocolate, licorice, molasses, and mild alcohol is rounded out with a nice bitterness. 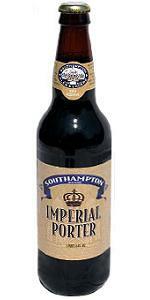 Mouthfeel: slighty heavier in body than other basic porters, and has a smooth and slightly dry mouthfeel. The flavor tones linger long into the aftertaste. Drinkability: superbly drinkable, one of the most enjoyable porters I have had. Must find this one and give it a try. Poured a dark brown color with a medium head that had good retention and left some lacing on the glass. The aroma was great. Lots of chocolate and sweet caramel malts. The flavor was much the same, but more complex. Very malty. Chocolate, hints of coffee, caramel, toffee, a little alcohol, all the malty goodness you could ask for. Very tasty. The body is moderate to thick and the drinkability is very good. Another great one from Southampton. Came to me looking very dark to almost black with a good off white head. Smelled of roasted malts with a hint of chocolate and coffee but very hard to get a good scent off this. The taste was dissapointing for me. This being my first Southampton, I kind of hyped my self up and it let me down. It was a little bland for the style but there was a bit of bitterness and some milk chocolate that balanced out and made for an ok brew. The mouthfeel was a little thin but the carbonation was ok. Not impressed but for what it is I might be tempted to give it another try. Also, I won't let this experience keep me from trying other beer from Southampton. Pours dark, dark brown with a light brown head, big ol' bubbles. Short lived. Hint of smoke in the aroma, prunes, chocolate malts, red wine. Low carbonation, medium to thin mouthful, but vevetly smooth. Taste is more chocolate malt notes, dark fruit, caramel, a bit more smokiness ,and a nice touch of hop bitterness in the finish to round things out. This one was the 22oz brewed in Saratoga Springs. I could care less, as it's an excellent porter. A vigorous pour gets a one inch deep tan head to develop on top of a dark almost black body qeilding no light even when held to a burning bulb. Head fades to just a skim in minutes leaving a hint of lace. Nose has notes of brandy soaked raisens, burnt brownies and coco and rusty metal. A clean fuzzy hue enters the mouth joined by biscuity maltiness. The palate is very well balanced with a fullness that includes a strong mineral presence and an attractive nutty feel. The belly does warm a bit but this is the only hint of the alchol presence. I find this to be a great representation of the baltic porter and fans of the style will enjoy it. I do suggest letting this beer warm properly as the richness and robust sweetness develops and becomes even more unique with proper tempature. A bit of bitter on the back of the tongue, kind of like dark chocolate develops twords the end. Mouthfeel is a mineraly richness. I think this to be drinkable and almost sessionable for the style. pours a thick tasty looking engine oil black with minimal head. heavy chocolate toffee/caramel, and coffee malt aromas. slight fruity wine-like and vanilla aromas as well. chocolate and toffee dominate the taste with the vanilla backing up that followed by some of the wine-like characteristics at the finish. the wine has some dark fruits that come along with it. all the flavors have a sort of toasted/burnt characteristic. a hint of smoke in there somewhere. a little bitterness for the herbal hops wrap things up and dry it out a bit, though i could use a bit more. rich and fuller side of medium bodied with pretty timid carbonation. an enjoyable beer with plenty of complexity, i can't really think of anything to knock about it, but there is something about it that doesn't let me say it's anything other than a solid 4.0. Bomber. Dark as night color and viscous. Great roasted aromas very smooth on the palate and great coffee and mocha flavors. Compared to Baltic Thunder I would say this one has more body. Nothing age worthy in my book, but then again I don;t look to age these. Great baltic, would have again if it were around. The beer pours a deep dark black color with a thick frothy tan head that slowly fades to lacing. The aroma is great. It has a dark malt scent that is heavy in crystal, chocolate, and roasted malts. It's sweet with hints of chocolate and dry roasted aroma. The taste is awesome. It has a smooth black and chocolate malt flavor; sweet and earthy. It goes down easy and finishes chocolatey with a dry earthy aftertaste. The mouthfeel is great. It is a full bodied beer with adequate carbonation. This is a damn fine beer. It has everything I'm looking for; a great drinker. Pours deep brown, with a decent tan head that sticks around a bit. Nose is some chocolate, coffee, a bit of roasty caramel sweetness in there also. Taste is the same -- strong notes of coffee, roasted malt, maybe a hint of dark cocoa, hints of dark fruit. A bit dry overall, with a full body. Beer is supremely smooth and dangerously drinkable. Subtle carbonation, fairly viscous mouthfeel. A delicious and almost dangerously drinkable beer. A bit disappointed in this one. Pored a deep garnet with almost no head and little discernible carbonation. Nose was rich with roasted malts and a hint of sweetness. Taste was a bit flat with a noticeable astringent taste. I feel many baltic porters effectively play right up to that edge, but this one crossed it and didn't have the surrounding flavor profile to compensate. Richly roasted taste with strong bittersweet chocolate throughout getting even more pronounced on finish. Carbonation was lacking for the style. Deep brown almost black in color with a finger of tan head that hangs around forever. Aroma...hmm, not much to say here. Really, not much to say because there's not much to speak of. Certainly it's not bad but I sort of expected a strong Porter such as this to have a little smell to it. I can pick out a bit of roast and maybe some smoke but its all very faint. Taste delivers a little more than the smell with some smooth chocolate and caramel notes and bready malt. It's very pleasant but much mellower than almost any Porter I've ever had. Well, this is my first commercial sampling of this style. I know it tends to be clean, often brewed with a lager yeast, and much less aggressive in terms of roasted malts, but this is even smoother than expected. All in all pretty good, although I think I prefer something a bit more aggressive. A very dark brown (nearly black as night) beer. Has a big creamy light brown head. Light chocolate and coffee notes in the aroma. Very smooth mouth feel goes hand in hand with the milk chocolaty flavor character with some bittersweet coffee notes on the finish. At 7.5% this goes down very easy. 12 oz bottle allowed to warm for about 15 minutes, then served in a snifter. A: pours a deep, dark, clear mahogany but is opaque and nearly black in the snifter. The frothy light brown head is mostly short-lived but leaves some lacing. M: full bodied, if not quite chewy; creamy smooth; well-chosen low carbonation. O: This excellent Baltic Porter is rich and malty with ample notes of roasted grains, and dark fruits. This beer is nicely crafted, with enough complexity and depth to maintain interest even if used as a session beer. Provided by orbitalr0x as part of BIF 30, this beer came in a 22 oz. bomber. When poured it looked dark brown to black with a body that appeared opaque at first glance, but revealed ruby highlights when held up against strong light. The beer came out sounding fizzy like a soft drink, and the head was foamy and one inch thick immediately after pouring. It died down to a more modest crown of bubbles shortly afterwards, and ended up as a thin ring by the time the glass was mostly consumed. Not much lacing to speak of either. The aroma was very pleasing, with chocolate, caramel, dark fruits, and hops is a sweet harmony. The taste was similar, but with dark fruits playing the lead role, followed closely by the caramel. Lactic sourness was a good counterbalance to the sweet malts. Not many burnt or roasty flavors to speak of, except a little bit of burnt toast like astringent bitterness. Alcohol was quite warm and soothing. The beer was very easy to drink despite the multitude of flavors. If I had to point out one flaw, it would be the thinness of the body when compared to other examples of the style. A well constructed beer that I wouldnt mind having again. 22oz bottle poured into an imperial pint glass. pours a light black color, dark garnet when held to the light, with a two finger tan creamy head with good retention leaving thick lacing that slides back to the beer. Sweet aromas of caramel, butterscotch, and stone fruit. Up front flavors of brown sugar and dark chocolate with a mild hop flavor to balance, alcohol warmth in the middle with a milk chocolate finish. Low carbonation, slightly thin mouthfeel. Very easy drinking porter, not too much of anything. Bottle: Poured a pitch-black porter with a small foamy dark head with average retention. Aroma of chocolate is well mix with some roasted malt. Taste is a mixture between sweet malt with slight roasted bitter touch and some smooth chocolate undertones. Creamy texture is really interesting but body is lacking. This is a really good beer that would have been great had there been a more fuller body. D - Not much flavor going on. There are some dried fruits, but no much of anything else going on. Presented in a 22oz bottle bearing no freshness date and poured into an imperial pint glass. Had a glossy near-black color and a one-finger beige head that faded down to a thin skim and left no lace. Nose had major chocolate and dark malt notes with a sweet caramel undercurrent. Also had the slightly acrid aroma of old stale coffee. To start, there was a pervading sweetness of caramel and dark fruit. Not to be outdone, a counterpointing bitterness presented itself in the flavors of bittersweet chocolate and espresso beans. Finishes up with a smooth alcohol bite. These tastes nicely complemented each other, yielding a rich, flavorful brew. The feel was medium heading toward full and creamy with a drying finish. Overall, this was a very drinkable, pleasing Baltic porter. A nice introduction to the Southampton line. Pours a jet black color with a medium sized tan head. Average aroma emanating from this one, some roasty malt and some coffee creamer. Light in body, silky smooth with nice carbonation great mouthfeel even though some may say its a little thin, i remember this beer in years past (22oz bottles) being a bit bolder and bigger in body and flavor...oh well. Dark malt dominates the flavor, a mild bitterness on the finish that i wouldnt quite call a true "hop character' in this one. My only complaint is the yeast chosen, it tastes like a macro lager strain. One of the better samples i've had since the Southampton fiasco, and the first ive had out of Latrobe under the SH label. Mild aroma of dark roasted malts on top of raisins, and a creamy vanilla yeastyness that reminds me of a big Belgian. A long distance poured pour only resulted in a small dark tan head that faded quickly to a whispy film. Deep cola colored beer with a ruby hue that shows little activity. Fairly strong, mildly sweat port and raisin flavors mixed with some creamy vanilla. Just a dash of dry, bitter dark malt pulls through making for a drier finish. A smooth, full bodied beer that delivers plenty of flavor without being sticky. I really like the contrast between dark roasted malts and deep vinuous flavors. I'll be picking up a few more for the cool fall days to come. A. Served on-tap into a snifter glass. Dark opaque brownish black with a slightly off white head which exhibits some lacing. S. Roasted malt and chocolate toffee. T. Robust roasted flavor with some bitterness from the hops. The alcohal is hidden. M. Smooth and full bodied. D. I enjoyed this one alot.